Reblogged from Reformation 21, the online magazine of the Alliance of Confessing Evangelicals. This article reviews an important book that scrutinises the theology of Dr Timothy Keller. This fascinating volume is something of an in-house discussion into which, because of the nature of the debate, we are invited to peer. The contributors are, by and large, British Presbyterians (Scots and Welsh well represented! ), though William Schweitzer (editor and contributor) is American by birth, and D. G. Hart (contributor) speaks from the other side of the pond (at least, from where I am sitting). This is significant for two reasons: first, most of them feel the impress of Keller’s labours without necessarily being under his direct influence, and, second, they all hail from within the same doctrinal orbit – subscription to the Westminster Confession of Faith. It is this confession which forms the backdrop to this volume of essays, for this shared standard provides the rule against which the discussion is taking place. 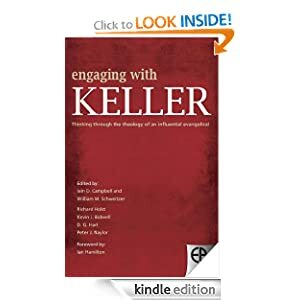 Recognising the sway that the gifted Keller holds over many Reformed and evangelical Christians, especially those of younger years, this volume aims to address a single basic issue: to “consider whether some specific aspects of Keller’s teaching are biblically accurate ways of transmitting the Reformed faith” (p.17). (For those inclined to agitation about such matters, there is no requirement in public theological discussion for participants to deal with one another privately, as they are not dealing with personal sin in a church context. Nevertheless, the editors have communicated the full content in advance to Tim Keller.) In other words, is there any degree to which Keller’s attempts to communicate the truth of Scripture (in a mode that the world deems relevant) have softened or blunted the edges of that truth? Read the rest of this excellent book review here. I would like to hear feedback from anyone who reads or has read this book!